Gabions shall be manufactured from a hard drawn steel wire formed into a bi-axial mesh grid by electrically welding the cross wire at every intersection. The weld strength is to be 70% of the ultimate tensile strength of the wire. The adhesion of the Galfan to the wire shall be that when the wire is wrapped six turns around a mandrel of four times the diameter of the wire, it shall not flake nor crack to such an extent that any of the galfan can be removed by rubbing with bare fingers. 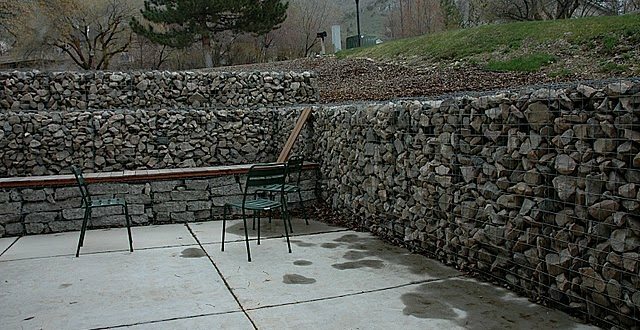 Gabions shall be provided with bracing wire and helical spirals for site assembly. The bracing wire shall be of nominal wire diameter of 2.2mm and the helicals of 3.0mm (all in accordance with corrosion protection specified) for final jointing. Gabion fill shall be hard and durable and non frost susceptible (rock or stone type) having a minimum dimension not less than the mesh opening and a maximum dimension of 200mm. All rock fill shall be packed tightly with a minimum of voids (final void ratio to be less than 0.3). Bracing wires from front face to rear face, and terminal end panels, to be spaced no further apart than 350mm in both vertical and horizontal directions. Gabions to be filled such that the mesh base of the unit above bears down onto the rock fill of the unit below.